Well after using the excellent evernote for a while and using a new Canon flatbed scanner to turn all my paper documents onto pdf’s it was getting a little tiresome waiting for the scanner to scan, turn the page over, etc for a stack of documents so I went looking for a better solution. I quickly found the simply amazing ScanSnap S300. Its a bit steep on the price at £160 from ebuyer (the cheapest I could find anywhere ) but its simply worth its weight in gold for the time saving, ease of use and quality of output! It’s easy to digitize documents with the ScanSnap S300! Just press the “SCAN” button and the duplex scanner quickly captures both sides of documents, presenting images as they are meant to be seen.With its built in automatic image correction features, the S300 ensures great scanning results. Simply load a stack of documents into the hopper and press the “SCAN” button. The S300 automatically recognizes the size of each document, detects and corrects for skew, and shows images in their proper orientation with blank pages removed. The ScanSnap S300 automatically converts scanned data into searchable PDF files. Now you can quickly and easily locate your images and find information contained within your documents using keyword searches. 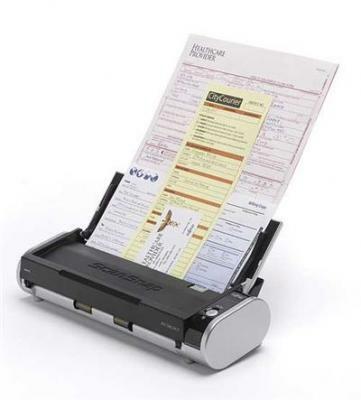 The ScanSnap S300 PDF scanner features double-sided multi-sheet feeding. The automatic document feeder holds up to 10 sheets of paper , and the scanner scans images at up to 8 pages per minute. For added mobile convenience, the Fujitsu ScanSnap S300 can be powered though the PC’s USB port* when an AC power source is not available. So far everything they claimed is true, I’ve never had a paper jam, even stuffing the sheet feeder with different type and shape of paper, its OCR is brilliant, and its fast even scanning duplex on USB power. Set on its default settings the documents it produces are crisp and very readable producing excellent prints when you need a bit of paper to take with you and most importantly they are compact, an average 4 page colour document being about 0.6mb. The two features that make it for me are its portability, it fits in a laptop bag with a Dell Mini Projector and a Laptop easily &its powered off USB so no more power blocks and the software can can straight to evernote (see review) so they are all automatically filed, uploaded and synced ready to access on any computer. The only drawback is the amount of paper thats now getting shredded and recycled, but thats better than stuffing it into envelopes and putting it in the loft where you’ll never be able to find it again!